ACCS training within the region offers an exciting, fulfilling yet challenging opportunity for post FY2 equivalent doctors to embark in a career in Emergency Medicine. Trainees have the opportunity to work, live in and enjoy the many attractions of training within Edinburgh and the regions. The three year programme offers a diverse and comprehensive exposure to Emergency Medicine and the allied specialties of ACCS. The first common two years include six month rotations in Emergency Medicine, Acute Medicine, Anaesthetics and Intensive Care Medicine within the region offering a complete experience across the training sites. The third specialty specific year allows further exposure to Emergency Medicine and Paediatric Emergency Medicine at the Royal Hospital for Sick Children Edinburgh. One of the main strengths of ACCS training within the region is the comprehensive support mechanisms both formal and informal that allow the trainee to develop and enhance their technical and non technical skills over the three years. Enthusiastic Clinical and Educational Supervisors offer practical and professional support to mentor the trainee to mature and flourish during their ACCS training. 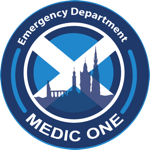 Plentiful opportunities exist to attain the necessary competencies for all stages of training and preparation for MCEM while working in one of the busiest Emergency Departments in Scotland. There is a well established research and academic grouping within the region that can support, develop both research and audit activity of individual trainees. Teaching offers the opportunity to consolidate both the theory and practical skills and is well supported by all consultants. Competitive recruitment is nationally organised through the London Deanery for all Scottish regions. The on line process usually opens in November with selection occurring in January for commencement in August. If Emergency Medicine is the career for you or you are not too sure and want further advice and information please contact us.